Shares in US brewer Anheuser Busch, the maker of Budweiser beer, have jumped on a report that Belgian firm InBev is working on a $46bn (£23bn) takeover. Anheuser shares closed up 7.7% at $56.61, close to record highs. The Financial Times reported on its Alphaville blog that Stella Artois maker InBev had arranged financing for an offer worth about $65 a share. Both companies declined to comment on the report, though analysts said rumours had been swirling all week. "Anheuser-Busch shares and options have been active throughout the week due to rumours of a takeover," said William Lefkowitz, options strategist at brokerage firm vFinance Investments in New York. 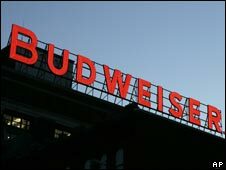 In addition to Budweiser, Anheuser's brands include Michelob, Bud Light and Rolling Rock. InBev makes Beck's, Hoegaarden and Staropramen. It has a distribution deal with Anheuser for its beers in the US. SABMiller overtook InBev as the world's largest brewer last year. Rivals Heineken and Carlsberg have also been expanding and jointly purchased Scottish & Newcastle earlier this year.